A few days ago I was exploring the blogger world and came across a post in which the blogger was declaring their love for fur, dismissing the cruelty which surrounds the creation of fur items by stating that hundreds of animals get slaughtered anyway. It's this kind of attitude that fires me up, the I'm one person so it doesn't really make a difference if I do something bad opinion, don't those people stop and think what it would be like if everyone thought like that? I don't even get why people wear fur in today's society. It's definitely not for warmth, seeing as we aren't cavemen and have numerous other options for warmth that don't involve slaughter. It's not to reflect wealth, because again there are hundreds of other ways to do so. Is it as simple as style? Well if thats the case there are great fake furs out there. And when it comes down to it what you wear one the outside, to a degree, reflects your personality, opinions and attitudes. Do you really want to reflect to the world that your ok with animals being slaughtered in gruesome ways for superficial reasons? omg that photo is too chilling. i hate people who wear real fur. i have one faux-fur which is wore in my latest post and even with that one i feel like i shouldnt wear it sometimes. i'm still on the fence about faux-fur. but i would never EVER wear a real fur. its just too cruel. this picture will haunt me for the rest of the night and probably tomorow as well. Was not my intention with that pic to disturb people but rather get the point across visually. I think I'm the same with faux fur as well. I think you should email the photo to that blogger, and I think I read it too..not sure wear though.. Animal cruelty seems to know no bounds. The use of the image as a visual - sends a powerful message. You can always make a difference. It's important to stand by your beliefs - even if it means one less trend item. That peta ad is something to leave your mind thinking about being a part of that cause. I'm also an anti-real fur. I dont like to don something from dead creatures. it creeps me out. Wow-that photo definitely gets the message across! I too am very opposed to the killing of animals for fur. But up until now, I thought "vintage" fur was alright since the damage had already been done. However, your last sentence: "Do you really want to reflect to the world that you're ok with animals being slaughtered?" That line really makes me even reconsider vintage fur. Thanks for an awesome post! for me it's ok to wear fur, as long as they're vintage or cool-looking faux ones. 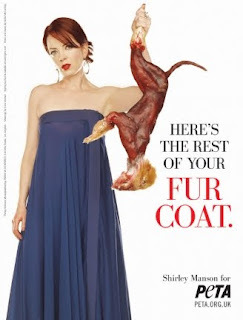 I don´t wear fur myself, but I don´t condemn those who wear it. If it is the animal cruelty you react to, then stop eating meat. Telling people to wear faux-fur still sends the message that fur is a desirable, fashionable, luxurious item. Aren't you still sending the message that the slaughter of animals for style is okay if you wear faux fur - because really, who can tell whether somebody's fur jacket is real just by looking at it? I actually agree about the message of faux fur but if people are wearing it for the aesthetics why not just wear faux. In regards to why don't you just not eat meat, eating meat and wearing fur are for very different reasons. "Eating meat is very different" is a very convenient statement. So eating an animal is okay but using its skin is bad? 2)I am not a vegetarian, at the moment its because I live at home and don't really have a choice, that being said I honestly don't know if i will be able to give up meat because it is convenient both in preparing meals and in regards to nutrition and I found haven't really found a good alternative which has the same value and taste (unlike fur where there are numerous). And although I eat meat I am not dismissive of the issues that surround it, I know that are practices out there that are a less cruel options that some others out there e.g. free rage, cage- free etc and they definitely play a role in my choices. And finally I am not trying to herald myself as being morally superior just expressing my opinions. just out of interest, what about leather?? Fashion is something else. It is a luxury and not a necessity. i am very passionate about this subject and i feel that people are blissfully ignorant about what goes into wearing a fur coat... and if they are aware then they are horrible people! "to die for" fashion is one thing but killing for fashion is another! chevy seat coversQuail West Naples Florida However, as a girl who over the past few years, especially over the winter, has tended to favour the blacks, whites and grey (and a splash of red for colour) this trend is a little new for me. So this post is for those like me- keen to try the trend but in need of a little inspiration. My favourite out of the below looks is Stephanie Pratt's- bright orange and pink work really well together and I like the cut of the top.